Shin Splints is a general term used to refer to pain on either side of the leg bone that is caused by muscle or tendon inflammation. Tightness and/or tenderness along the shins that comes on with running or walking for long distances. The pain usually settles upon resting. Shin pain is quite common in people who have just taken up running. 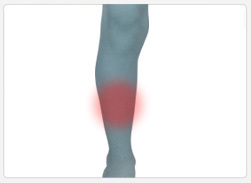 What cause pain in the shins? Shin splints are commonly caused by over-stretching of the muscles and tendons along the shin bones (the tibia and fibula), as a result of over-use. In addition, over-pronation of the feet can be a major contributing factor to shin splints. Excess pronation results in internal tibial rotation which in turn increases the tractional forces on ligaments in the lower leg. To help prevent shin splints it is important for athletes and runners to slowly build up their activity levels. Foot orthotics can be helpful as they help reduce over-pronation. Supportive footwear is also important to provide rearfoot stability. Other treatment options include: ice therapy, rest and deep tissue massage. A proper warm-up (stretching) before any sports activity is paramount.